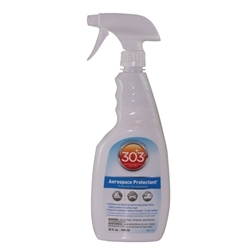 303 Aerospace Protectant - Its like "SPF 40 Sunscreen ... For Your Stuff." 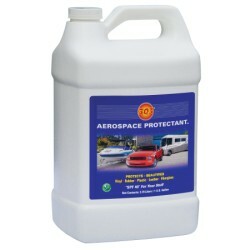 Originally engineered for aerospace and aviation applications, 303® Aerospace Protectant™ is a premium surface treatment that provides superior protection against harmful UV rays that cause discoloration, fading, embrittlement, cracking, chalking and/or loss of mechanical properties. 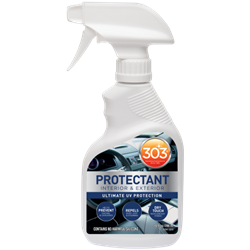 Safe and effective on vinyl, clear vinyl, gel-coat, fiberglass, carbon fiber, synthetic/natural rubber, plastics and finished leather. Good for use on: dashboards, automotive leathers, black plastic bumpers, vinyl decals, door & boot seals, vinyl convertible tops, boats seats, Tonneau covers, Dacron sails, inflatable boats, spa covers, and much, much more! 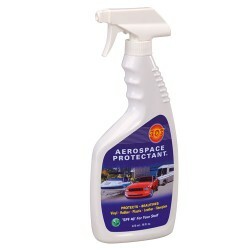 So many uses safe and effective on vinyl, clear vinyl, gel-coat, fiberglass, carbon fiber, synthetic/natural rubber, plastics and finished leather. Good for use on: dashboards, automotive leathers, black plastic bumpers, vinyl decals, door & boot seals, vinyl convertible tops, boats seats, Tonneau covers, Dacron sails, inflatable boats, spa covers, and much, much more!